We’ve been recently working on a Win Forms projects for the first time in a long time. Whilst working through the security and trying to implement Client Application Services following this we ran into a problem. By right clicking on the User Interface Project, then selecting “Properties”, then clicking the “Services Tab”, we got the following error, “Unspecified error (Exception from HRESULT: 0×80004005 (E_FAIL))”. We are using Visual Studio 2010 Ultimate, with .Net 4.0 Targeting. We deleted the existing UI project and recreated it , added back our source code and presto it all worked again. My guess is the project file had become corrupted in some form. We’re now up and running again, implementing our security providers and locking down our application. I love having a Development Environment I can simply return to a known snapshotted point, but it seems so long between new set ups that you forget some of the gotcha’s that you fixed when you initially set it up. This is one of those really frustrating ones that seems to appear on a lot of servers in the wild and one I’d completely forgotten about until today when I had to fix it again. Web Controls Critical 7043 Load control template file /_controltemplates/TaxonomyPicker.ascx failed: Could not load type ‘Microsoft.SharePoint.Portal.WebControls.TaxonomyPicker’ from assembly ‘Microsoft.SharePoint.Portal, Version=14.0.0.0, Culture=neutral, PublicKeyToken=71e9bce111e9429c’. Thats it fixed, the error is gone, if only all critical errors that appeared were that easy to fix. With Christmas time around again I’ve been doing a bit of the freebie IT support for friends and family that we all seem to do. This time I got well and truly stumped trying to get Windows 7 installed from a USB flash drive on Samsung N130. I used WinToFlash to create the bootable drive as I’ve previously blogged about here. I couldn’t work out how to get this PC to boot off USB drive, tried selecting the drive with the boot menu and changing the boot device to the USB drive, with no luck. I stumbled upon this post here, where I found my solution. All I had to do was to change the boot order to make all the USB devices appear at the top of the boot order in the BIOS making the hard drive the last device and it worked a treat. Seems pretty odd you need to this, my thoughts would be this is a bug in the bios. Anyway Netbook is now running a treat with Windows 7, only had to install the Wireless Driver. After hearing all the buzz this afternoon on the new Beta of Windows Live Essentials release, I decided to upgrade. 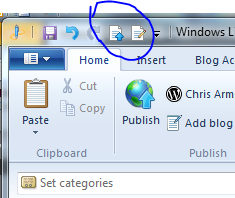 The main thing that has changed you will notice straight away is the new ribbon interface in it. I really like the ribbon interface, it’s actually difficult to go backwards when I’m forced to use old versions of Office when on client sites. 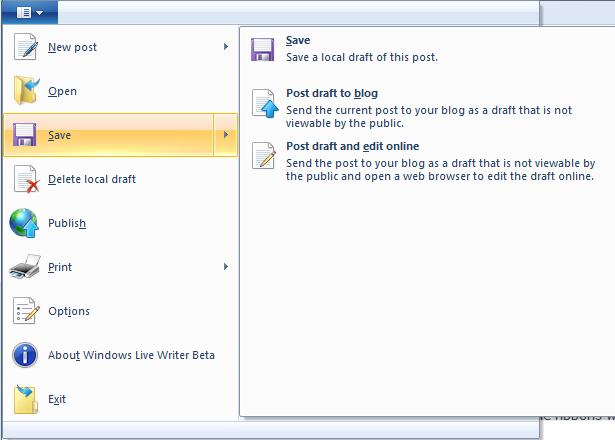 The one thing that I couldn’t find in this interface was the two features I use the most, “Post Draft to Blog” and “Post Draft and Edit Online”. I use these a lot as I blog from multiple PC’s so it’s fairly normal for me to start on one PC and continue on another. Although missing from the ribbons, when you look a bit deeper these features are still there. You can find these options by selecting the “Quick Access Toolbar” in the top left corner (where file used to live), then selecting “Save”. Since I use these options all the time, by right clicking on the item you can add them to the Quick Access Toolbar so they displayed across the top. As we’re all aware of by now Office 2010 has been released to manufacturing which has it and SharePoint 2010 becoming available to MSDN & TechNet Subscribers. On first impressions this version has been pretty good, I’ve been running the beta client pieces for the last 6+ months. It seems there’s a little confusion that has slipped in with this release though as for the first time we have both 32 and 64 bit versions of this release. If you’re like me and running 64bit OS (Win 7 in my case), because you need more than 4Gb of RAM. A trap that I found out from Ben Walters presentation at this months MOSSIG meeting was that Microsoft’s recommendation is to use the 32 bit version of Office 2010 even on a 64 bit Operating System, unless the user needs to manipulate large files, which I’m guessing is over 4Gb given that’s the 32 bit memory limit. Another interesting point for this was also that the plug-ins are going to be harder to get in 64 bit which probably a fair point. This little gotcha isn’t very well publicised but I found this line of text “In enterprise environments, the default is to install Office 2010 32-bit on computers that run either 32-bit or 64-bit editions of Windows operating systems. We recommend this option.” which I found within this TechNet article. Anyway time to uninstall 64 bit and go back to 32 bit. A while ago I blogged about installing windows from a USB Flash Drive. Since then I found an awesome tool called WinToFlash which is a point and shoot tool which will automatically create a Bootable USB Flash installation source. Try it out, it’s pretty simple and not only makes bootable copies of the install media, but also does some other cool stuff you can read about here.